While the cars, tracks, and teams in the NEO Endurance Series have all seen shakeups over the years, one constant has been the broadcaster. In fact, it’s a partnership that pre-dates the NES in its current form, as well as the broadcaster with its current name. “We’ve been working with NEO since… well, before RaceSpot was RaceSpot!” said Wil Vincent, head of commentary for RaceSpot TV. Indeed, Vincent and his fellow commentators have provided live coverage of NEO dating back to the spring of 2013, when the organization then called Glacier TV broadcasted the first season of NEO competition, which was made up of a series of solo-driver sprint races. 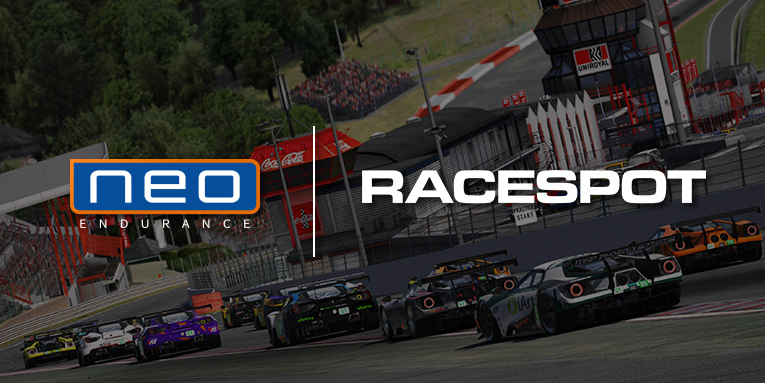 That partnership is set to reach its six-year anniversary early next year, as the two groups have agreed to an extension that will see RaceSpot cover the fifth season of the NEO Endurance Series beginning this fall. For both parties, it was an easy agreement to come to since the partnership has proven mutually beneficial. A lot has changed both with iRacing’s content and with sim racing broadcasting since 2013, and Vincent said he’s pleased with the innovations that RaceSpot and NEO have made together. A new innovation is on the way for next season, as for the first time, RaceSpot will provide live coverage of NEO’s pre-race qualifying sessions, which will shift to Sundays before the start of each race except for the season-ending 24 Hours of Le Mans. Hekkens said several factors influenced the change, including respecting the wishes of many teams and drivers in the post-season survey, avoiding conflicts with Saturday races during the endurance season, and automating the race day procedures to have qualifying times automatically set the starting grid. This means the stress- and sometimes penalty-inducing target times are a thing of the past for NEO’s six-hour races. Once that decision was made, Hekkens said he approached RaceSpot about showing live coverage of the open qualifying sessions, which will see each class have 20 minutes on-track with a 5- to 10-minute break between classes. “After we decided to move qualifying to Sunday, I had the idea to broadcast the qualifying session as well. I’ve always had this idea in mind, but didn’t really make sense before,” said Hekkens. Vincent echoed those thoughts and said the qualifying broadcasts will be focused on one thing. In that sense, Vincent said RaceSpot’s coverage of NEO qualifying will be of a greater “level and extent” than with other races that use attached qualifying sessions, such as the World Championship Series events. The addition of LMP1s as a third class for NEO this season will also add an extra dimension to the broadcasts, and the RaceSpot crew has been busy behind the scenes to become acquainted with the new cars and their technological wizardry. “What we love about our crew is that almost all of them drive a variety of cars on iRacing, and all are big motorsports fans,” said Vincent. “Many of us have driven the LMP1 cars, and I personally watched 18 hours of Le Mans this year, as well as going to WEC races (with Niel!). “I’ll be frank here — I don’t want non-endurance people in an endurance booth. If you can’t understand the cars, how they work, and how multi-class racing works, there’s no point being there. Vincent, who said one of his most special accomplishments was broadcasting NEO’s first 24-hour race in 2017, promised that the addition of an extra class won’t mean the broadcasts focus too heavily on the new prototypes. In fact, past experience, especially in covering last season’s hyper-competitive GT class, showed Vincent and his team that “it’s often not the prototype class that has the best racing”. But teams and drivers in all classes can rest assured that if they’re in a close battle, the broadcasters will try to find them. With around 64 hours of live coverage expected — roughly 10 hours more than in season 4 — including twice-around-the-clock coverage of Le Mans for the third consecutive season, the RaceSpot team should have plenty of time to discuss all aspects of the series. Still, Vincent said one of their biggest challenges this season would be “getting fair airtime to all”. All of NEO’s races along with RaceSpot’s other broadcasted series will air on the newly announced iRacing eSports Network. Vincent encouraged teams and drivers to get involved now by subscribing to that YouTube channel and sharing the news with their followers in anticipation of the upcoming season. Without tipping their hands, both Vincent and Hekkens said they had some other new ideas for ways to spice up the race broadcasts, but viewers will have to wait until the start of the season to see them. And that’s not the only thing that Vincent was tight-lipped about. When asked about any bold predictions, such as which team or manufacturer might top each class, he joked that he’d leave that job to some of his fellow commentators.